Do you foresee Progressive Design-Build becoming as popular for buildings as it is currently for the water/wastewater sector? Why/why not? Answers to this question could be featured in the Perspectives section of DBIA Integration Quarterly magazine. This quarter's edition will be distributed to all of DBIA’s members by mail, as well as DBIA’s entire contact list via email. Please email your responses to gcorey@dbia.org no later than Monday, May 6. Registration for the 2016 National Design-Build Student Competition is now open until Sept. 2, 2016. The two-phase competition brings together teams consisting of five students from diverse fields of study (two students must be from a design or architecture program) collaborating on a Request for Qualifications (RFQ) for a parking facility on a liberal arts college campus in the United States. Finalists will then respond to a Request for Proposal (RFP) and the top three shortlisted teams will present in person at DBIA’s Annual Conference in Las Vegas. For more information and to register, click here. The Design Build Institute of America (DBIA) recognized the Virginia Department of Transportation (VDOT) as Transportation Owner of the Year this month at the DBIA Design-Build in Transportation Conference in Charlotte, N.C. 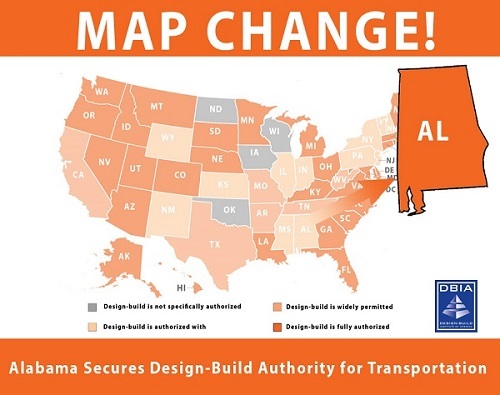 The number of design-build projects in Virginia has steadily increased since VDOT first began using the delivery method in 2004. Currently, there are 29 design-build projects in progress, valued at $1.17 billion, which represents 54 percent of its total contract value of $2.16 billion. Introduced Tuesday morning, the Water Resources Development Act of 2016 would authorize 25 Army Corps of Engineers projects in 17 states that already have funding approved. Those 25 projects would total $4.5 billion and include projects that would improve ports, rebuild levees for flood control, increase hurricane protection in Louisiana, and build ecosystem restoration projects in bodies of water across the country. In addition, the bill includes $4.8 billion in investment in the country's drinking water and wastewater infrastructure. Please note that DBIA members can register for this conference at ASCE member rates. In order to do so, they’ll simply have to register as a cooperating organization member and select DBIA from the list of cooperating organizations on the registration page. A synopsis of the expansion project has been posted by the General Services Administration, which began seeking bids for “a single, firm-fixed-price contract for the design and construction (design-build) of a data center in Pocatello, Idaho” in February. The synopsis calls for design and construction of a data center with a total facility square footage of 100,000 square feet, including support space. The data center also will be designed and constructed with a capacity of 5.4 Megawatts of electric power and approximately 25,000 square feet of data hall with future data hall expansion capability of approximately 8,000 square feet. The project also calls for a three-story addition of about 45,000 square feet to the existing administration building, which will be added to the base proposal. What's Fueling $5.5 Billion in Houston Developments? Houston's health care development is booming due to several factors such as the impact from the Texas Medical Center, a growing and aging population base and the Affordable Care Act. In downtown Long Beach, Calif., Arup has helped facilitate something quite unusual. The City of Long Beach and Port of Long Beach have achieved financial close for the Long Beach Civic Center project—a $520 million mixed-use, public-private partnership endeavor—with Arup having served as lead advisor to both entities as they embark on a one-of-a-kind, integrated design-build-finance-operate-maintain venture. It’s quite an undertaking, and Arup deftly handled its responsibilities on behalf of Long Beach and the Port. A global interdisciplinary consulting and design services firm, Arup put together a team involving architectural firm HOK, BAE Systems’ Real Estate Solutions services and MBI Media to provide the City and the Port with an all-inclusive advisory package consisting of financial, real estate, design, engineering, commercial and consulting services. 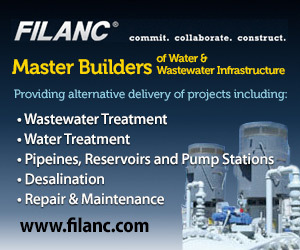 There is a growing trend in the industry, especially in the public sector, to move toward alternative project delivery. The move to alternative project delivery (APD) has caused a shift in the scale of some infrastructure projects. “To capitalize on the inherent savings associated with APD, Owners are increasing the average size of their projects. These two trends are drawing much more international competition for larger, more complicated projects,” says Virginia Grebbien, Parsons’ chief of staff. This annual summit will focus on California’s energy and water future and will consist of three panel sessions: Pioneering New Approaches to Reach California’s Goals, Sustainability Challenges and Opportunities for Los Angeles, and Partnership to Address California’s Water Crisis. Virginia Grebbien, Parsons’ Chief of Staff, will participate in the third panel session. Other participants will include executives from the Metropolitan Water District of Southern California and LA Sanitation as well as other industry firms. Ms. Grebbien will emphasize water supply innovation and alternative delivery approaches such as design-build and public-private partnerships. The Navigational Clearance Project is expected to cost $1.3 billion. The principal contractors are Skanska Koch, Inc. and Kiewit Infrastructure Co., which are also collaborating on the Kosciuszko Bridge replacement span over the Newtown Creek between Brooklyn and Queens. The Port Authority expects the Bayonne project to generate around 2,800 construction industry jobs with between $240 and $380 million in wages. George Ball, the chief financial officer of US-based engineering consultancy Parsons, says one of the facts that fascinates people in its home market is that the company’s biggest office is not its headquarters in Pasadena, California, but its office in Abu Dhabi. In the UAE, it has been joint programme manager (with AECOM) for stage one of the Etihad Rail project and is supervising construction of the Dubai Canal, as well as overseeing infrastructure design of the Expo 2020 site. In Qatar, it is a joint venture partner designing Qatar Rail’s Long Distance Rail project, as well as overseeing infrastructure works at Lusail City and parts of the Doha Expressway project. In today’s lending environment, contractors in search of financing must do everything they can to position their companies in the best possible light to bankers and potential lenders and avoid high risk lending factors. Banks will evaluate a contractor’s credit worthiness by analyzing financial and non-financial information. The smartest buildings of the future will be those designed with people in mind, according to a new breed of architects trying to put the human at the center of the process. This can mean design that speaks directly to the function of a building - a hospital designed to help make people better or a school that aims to redefine education. Or it may mean using technology to allow people to get involved in the design process or feedback on how they feel about living or working in a particular building. As part of its Tomorrow's Buildings season, the BBC looks at four ideas that aim to do all of the above. Cities are going down. To manage relentless growth, urban centers are expanding underground at an unprecedented pace. But it isn’t just the crush of humanity above the ground that is behind the subterranean push. It also is the result of dramatic advances in a field almost as old as civilization: tunneling. City of Saint Petersburg Water Resources Dept.